Blue Heeler visited Madagascar during October 2014. Our voyage from Reunion to South Africa took us around the northern tip of Madagascar rather than the voyage directly south. 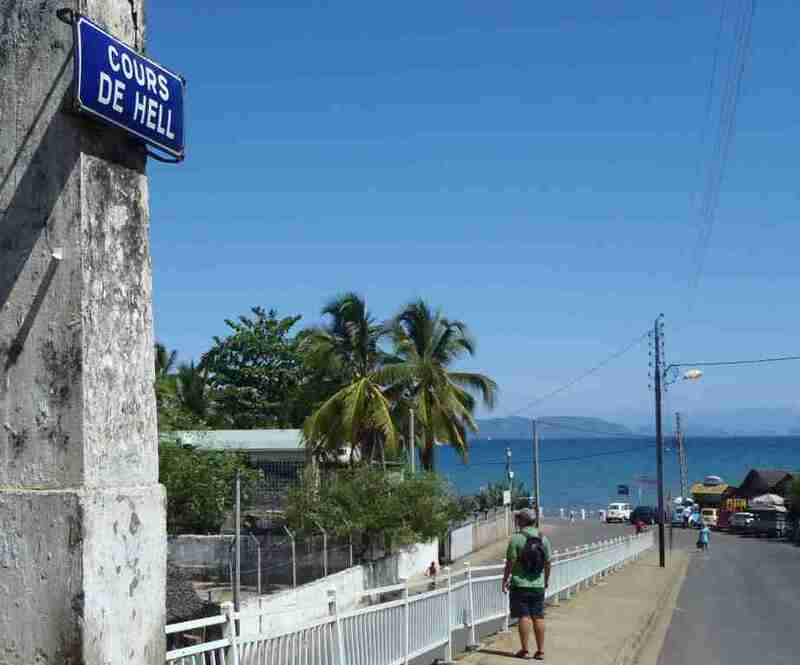 We had a good run and with only a few weeks to visit, went directly to Hellville, while others opted to check-in at Saint Marie or Antisiranana (Diego Suarez). At the time of our visit there was a small Police office located on the wharf. This will be your first port-of-call at Hellville. No doubt by this stage you’ll have a boat-boy sticking very close to you and helping you with the check-in process. I would recommend that if the Police ask for payment, smile and say you have no money and will need to go to bank to get local money. They’ll try and hit you for a ‘gift’ but keep smiling and say no. The fee at the time was MGA60000 and they’ll give you a receipt for that. They’ll stamp your passport but we had to return later as the ‘chief’ had to sign it. They need a copy of your last port clearance and crew list. We made the mistake of saying that we had enough Euros to pay so they expected a gift – what should have been 20 Euros ended up about 30 Euros. Next is the Port master. He’ll charge around MGA57,000 and will give you a receipt and cruising permit – Permis de Circulation. He needs a crew list and original of your last port clearance. Next is Customs. Walk into town about 1km. Turn right at the church on the Main Street and 100m down on right corner is Customs office. Very easy and only MGA20,000. He wanted a crew list only. Your boat boy will be able to help you find the office. Return to Police to pick up your passport and you’re done! Nosy Be as we understand it is the only place to check out before crossing the Mozambique Channel. The sequence was Police, Port, Police, Customs. Our experience was Police, where they stamped us out, including our Permis de Circulation.Then to Port Master where he gave us our port clearance for another MGA35,000 (with receipt); back to Police to view the port clearance and hit us up for another ‘gift’. (Told him we paid it on arrival and that we had nothing left to give!). Usually Customs is next on the list, but we were told it didn’t matter this day. I heard that if you do go to customs he’ll ask for another MGA20,000. 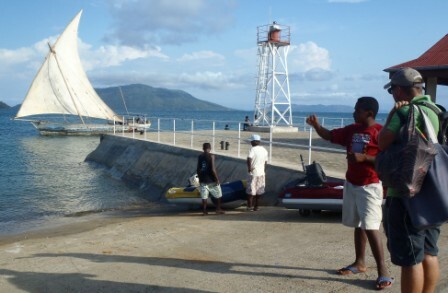 A BNI Madagascar bank is a ten minute walk into Nosy Be. There is an ATM that accepts Visa and MasterCard. Daily limit is MGA400,000 (about US$150). Notes are served in 10,000 denomination so it pays to get some small notes when you can (500, 1000, and 2000 notes are handy to have). There are other banks around Nosy Be but I only used the BNI. Our boat boy often had Euros he wanted to exchange for local currency. Obviously he received tips in Euros but couldn’t exchange them any other way. Follow the Boulevard De L’Independence and turn left at Rue Pierre Ler. Here you’ll find the Shampion supermarket. This grocery store is very well stocked and you can get most things here. Grab a tuk-tuk for about a dollar for the trip back to port. Further up the boulevard is the main meat and veggie market on the left. You need these guys at Hellville unless you can arrange to drop off at the dock and return your dinghy to your boat. Our boat boy was Romeo. He was good and we had no problem with him. I think his English was better than the others. His mate is Bob would drag our dinghy onto the concrete wharf, tie it up and watch it during our absence. 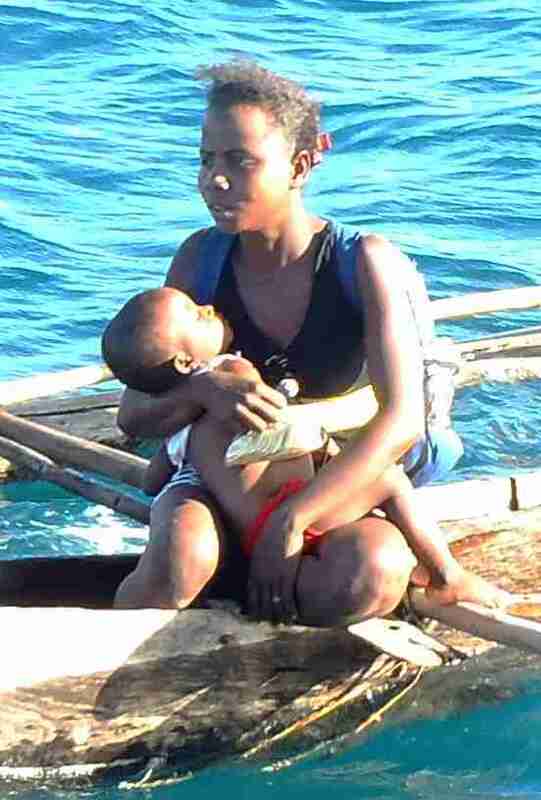 We generally paid them MGA5,000 to mind the boat for half a day and MGA10,000 for a full day. We didn’t stay at Crater Bay but I believe there’s someone to mind your dinghy there too. In a tuk-tuk we took four jerry cans to the nearest fuel station and had these filled with diesel for MGA2,940 per litre. ULP/san plomb was MGA3,650 per litre. Easy. We did not get our gas bottles filled but other yachties told us of their attempts. One boat had their bottle filled but after a week it had run out. Another said his took five days to fill. We were told it couldn’t be done without changing our POL fittings. Suggest you fill up all your bottles at Port Louis, or at least make sure you have enough to get you to Sth Africa. Internet provider ‘Orange’ in Madagascar is MUCH easier to setup than Reunion. If you need to update apps, or use a lot of Internet, wait until Madagascar as it’s much cheaper than Reunion. For 5Gb of data for 30 days we paid MGA97,000 (Approx A$40); mini SIM card for iPhone around A$4.00 and used iPhone as personal hotspot. 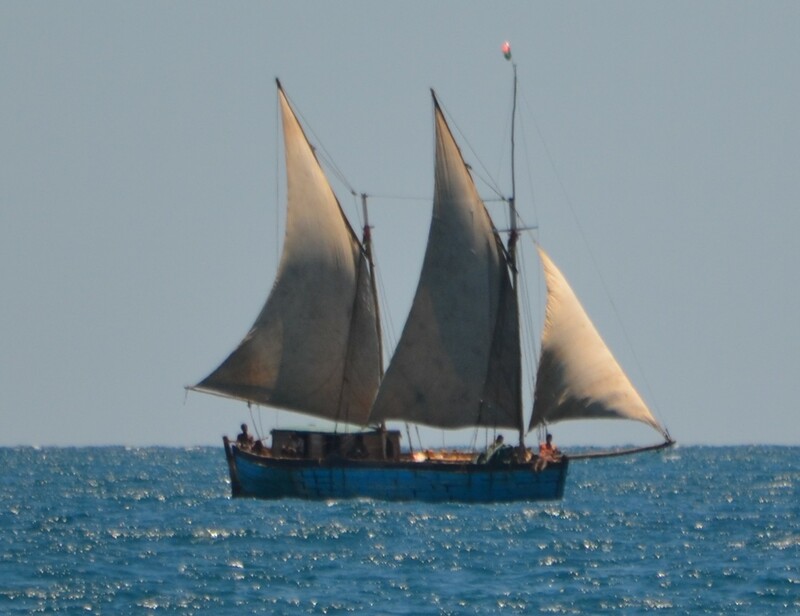 We’d read a lot of reports of theft in Madagascar including fresh reports from fellow yachties, but these events seemed isolated to Antsiranana (Diego Suarez). We take precautions to ensure everything is locked up when we leave the boat, including hauling the dinghy up each night. We even tidied up loose sheets/lines as these are a favourite of thieves. However, we had no situation where we felt it was unsafe or thought our gear was a target for thieves. Like anywhere in the world it’s the minority that cause trouble. The sailing is fantastic in the northwest and there’s plenty of anchorages. The water is clean and they don’t have the problem of rubbish or fishing flags in the water as you’ll find in Malaysia or Thailand. 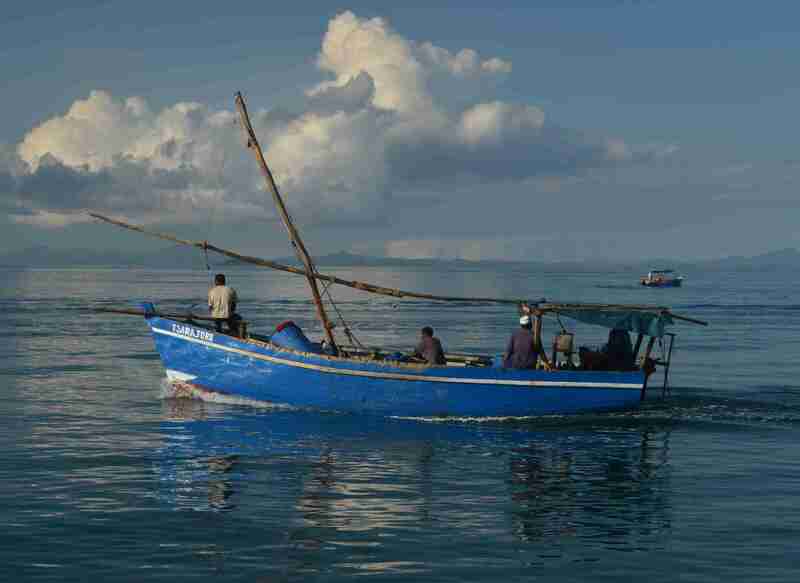 The fishermen in their pirogues paddle around or put up their small patched sails, while the larger fishing vessels with huge sail gracefully glide over the calm waters. Nosy Hao – 12.07.029S 49.02.345E – first place we anchored after passing the northern tip. Nice spot. Nosy Antaly – 12.33.713S 48.51.547E – this was a great little bay tucked behind this island with fishermen sailing by. Wind picked up from east and blew heavy overnight but good holding in 8m. Sakatia – 13.18.122S 48.10.689E – lovely spot. Good holding on eastern shore. Hellville – 13.24.460S 48.17.040E – muddy bottom, good holding. Nosy Komba – 13.26.532S 48.21.122E – we had calm waters although got a little rolly one night. Great spot to visit for swimming and eating at local restaurant Chez Yolande. Tanikeli National Park – 13.21.011S 048.14.380E – 10.000 Ariary per person to use mooring. Great view from lighthouse. Russian Bay – 13.32.124S 47.59.924E – can go ashore and meet local man Paulin? Anchored in 8m. First night okay, second night very rolly. Nosy Antsoha – 13.30.832S 47.57.838E – small beach to land dinghy. Day we went was quite swelly but anchorage was okay in 6m. 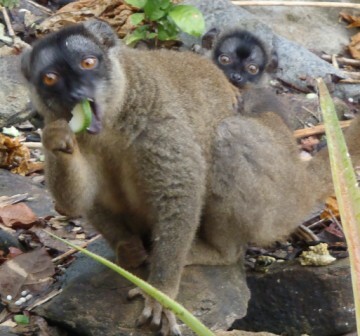 Heaps of lemurs come out from the trees and eat the fruit from the trees. River Baramahamay (Honey River) – 13.42.783S 47.54. 056E – local sold us two mud crabs for 10,000. Nice secluded spot. Nosy Iranja – 13.42.781S 47.49.801E – very swelly when we went but we managed to get ashore to look around. Very scenic and lovely white sand. Anchored in 9m. Nosy Lava – 14.32.619S 47.37.160E – we enjoyed calm conditions, although I imagine a strong swell would be unbearable here. CMap charts out substantially, but Navionics on iPad were good. Anchored in 9m. So glad we visited! Madagascar is such a feast for your senses. The sweet scent of frangipani or ylang-ylang, or the stuffy smell of old furniture when passing an outdated office; a layer of dry dust on your sunburnt skin; looking at a dilapidated French building and wondering what it would have looked like when new; touching the velvety paws of the lemur; tasting the fresh fruit – papaya, banana, and mango; hearing the laughter of the children as they finish school for their midday break. This is a very poor country, but the people are friendly, the kids are happy, and the villages are swept tidy! 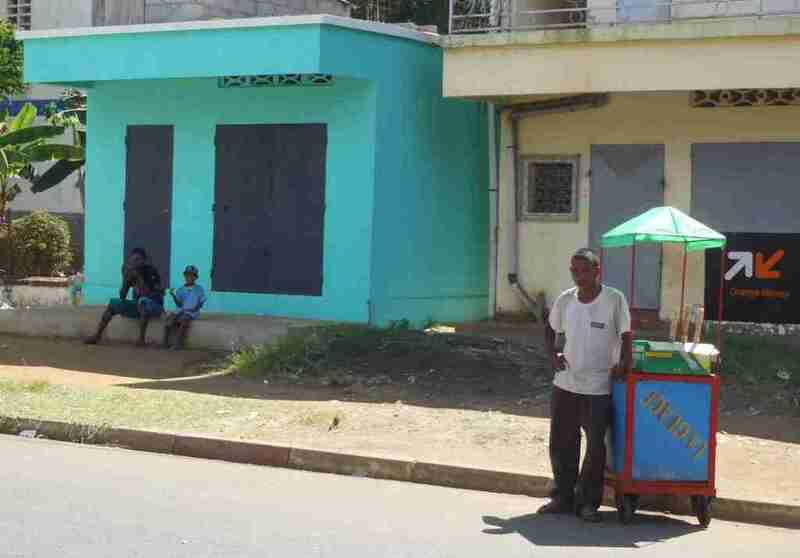 Nosy Be was a pleasant surprise – run down old colonial buildings, Citroen cars from the 1960s mixed with zebu hauling carts. Good eateries where you can have Filet de Zebu with Frits and tomato salad or perhaps Crevettes et Frites, plus some beers all for around A$10 per person. I hope this place doesn’t turn into a tourist nightmare as some parts of Thailand are, although there’s no reason why it won’t. Out of ten? Although we were only there three weeks, I give Madagascar an 8/10 for a great travel destination.